The second is my February Children's Literature Mini from Mari in Norway! She chose the lead character from one of her favorite childhood books and it is wonderful. 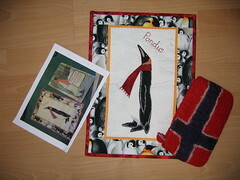 She included a picture of the book and a wonderful felted flag of Norway pouch. Not sure yet what I will use it for but it will be used! 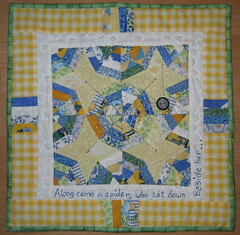 Last, but definitely not least, is my little quilt from Fanny for the Mini Quilt In a Bag Swap 2. For this swap we either purchased a charm pack or made up one from our stash and sent it to our partner. 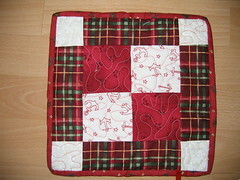 Our partner then had to use at least a small piece from each of those charms in a small quilt for you. I chose to make up a charm pack since I have no shortage of fabric and chose from my blue, yellow, white and green bins. Needless to say, Fanny outdid herself! I hope I can do justice to the charm pack she sent me! I also received 2 packets of 4-patches from my partners in the 4-patch swap. I got mine sent out on Tuesday and will post pictures of all of mine once they are all here.